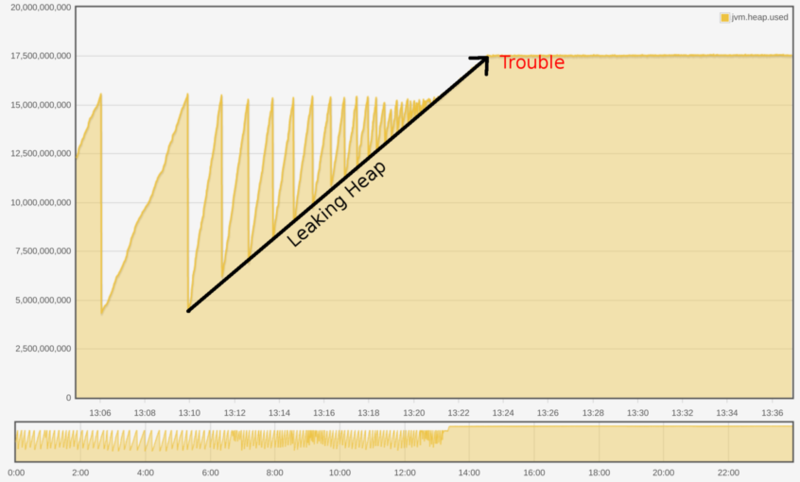 ​​​​​Recently at LMAX we’ve had a couple of services suffer from memory leaks. In both cases, we noticed the problem much later than we’d like. One stricken application started to apply backpressure on (really rather important) upstream components. Another caused an account related action to be intermittently unavailable. What we’d like to be able to do is detect when any of our java services is in acute heap distress as soon as it enters that state. We already have monitoring around causes of backpressure; we want to spot our issue a little earlier on in the causality graph (that’s two ridiculous names you’ve invented just in one paragraph. Enough! – Ed). Handily, each service already publishes its heap usage and gc times to our home-grown monitoring app. Even better, our alerting application already streams live events from that monitor into some alerting rules, so we have some existing scaffolding to build on top of. This construction will set things up so that monitoring events matching our key pattern are delivered to our consumer. Occasionally, a different thread will call sense to see if any faults are currently present. In our case, the keys we have available to us (per application, per host) are ‘heap.used’, ‘heap.max’ (both in bytes) and ‘gc.pause’. Can we reliably detect heap distress from such a stream of events? We could work out what percentage of time an application is spending in GC, and alert if it goes above a threshold. This isn’t too bad an idea. Unfortunately, that metric is published at most once per second per application, and it lists the maximum pause time seen in that second, not the sum. We could fix this, but we’d have to wait for a software release to get feedback. One thing we see in both of our failing applications is that they see consistent heap usage somewhere near to their max value. We could keep track of how many observations we see above a particular usage threshold, and once that observation count reaches a large enough number, alert. This would detect errors like the ones that we would see, but it would also detect slow growing heaps in well behaved applications. Alert code that produces more false alarms than real ones is, from our experience, worse than no alerting at all. We can keep hold of the last seen usage, and when a new value arrives, check if it is smaller. If it is, we can infer that a GC has occurred. If the amount of memory freed by that GC is too small, we could alert. Closer still, but can still generate some false positives. A collection can be triggered even when percentage heap usage is low; at that point it might be impossible to reclaim the required amount. 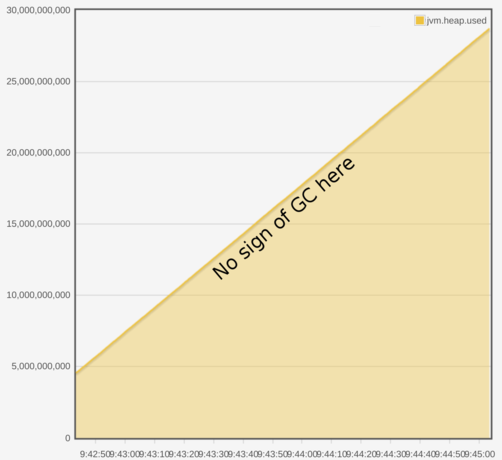 Alert if, after an inferred GC, more than x% of the heap is still in use. Still not perfect, but just about good enough. Why? Well, we see multiple ‘heap.used’ metrics published across a GC cycle, some of which may still be above the warning usage threshold. Those intermediate values could cause false positives. In practice, we found that we call ‘currentFaults’ infrequently enough to not be a problem. If we did, it would be the work of a couple of minutes to create a wrapper for our detector that only reported faults that had been present for multiple seconds. This one was a bit silly. We run our applications in six or seven different ‘environments’ that we consider important enough to monitor. Each environment might have application ‘x’ deployed on hosts ‘h1’ and ‘h2’. We managed to not test this at all in our spike implementation and immediately generated large numbers of false positives. Whoops. Having now written enough tests to convince ourselves that we weren’t totally inept, we launched the alerting app locally. We turned the warning threshold down to 10% to see if it spotted anything, and immediately saw some alerts. Clicking each alert (the ‘url’ feature of a fault is used to allow a user to see the data upon which the decision to alert was raised) led us to the following chart. At this point, a light went on in my head, and we went back to log not only the values we were seeing, but also the timestamps of the monitoring events. Aha. We appear to have gone back in time. How is this happening, though? Well, we deliberately use UDP to transmit metrics from our applications to our monitoring. We’re OK with occasionally losing some metrics, we’re definitely not happy if being unable to send them prevents our app from actually running. This is a potentially controversial choice, let’s agree to not discuss it here :-). When metrics arrive at the monitoring app, it has two jobs. One, to squirrel the data into a time series database on disk. Two, to transmit the data to appropriately subscribed websocket clients. The chart and raw data above are both served, post hoc, via the on disk store. The websocket feed is not. The UDP packets of monitoring data were arriving out of order, and it was truthfully forwarding those metrics to our alerting in the same way. We could probably fix that with some judiciously applied buffering, but given that each event we see is timestamped, we can simply drop events that are timestamped earlier than the last value we saw for a given service/host pair. This entry was posted in tech and tagged lmax on June 17, 2017 by grumpyjames.